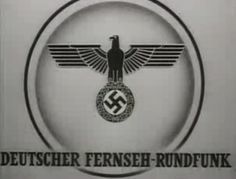 The broadcast sign-on image for the German television network (1938). "Alternate histories" are always popular. They usually have Hitler escaping to Argentina, or modern aircraft carriers transported back to Pearl Harbor (that theme actually has become very popular in Japan as well as the US), or Germany occupying England and sending Winston Churchill to the Tower of London. There are endless various that would "disturb the timeline." But what if the Third Reich had developed television? Honest-to-goodness Third Reich TV, or TRTV? I want my TRTV! What on earth would that look like? Would it be full of "Heil Hitlers!" and stiff Wehrmacht boys recovering from wounds and young blonde maidens doing dances and even references to "the camps"? The German postal service was responsible for promoting Third Reich TV. Well, in fact... yes, it would. Third Reich TV would have all of those things. Actually, we don't have to guess, it actually did have all of those things. There was television during the Third Reich, and each of those things - the Heil Hitlers, the young blonde maidens, oblique references to the camps (in a joking fashion, if you can believe it), wounded warriors - appeared on it. German television of World War II was not "like" television, it was television just like you would watch on the Ed Sullivan Show in 1965 or, for that matter, today, though of course in black and white. It was of quite good picture quality, too, almost up to the standards of contemporary films. There weren't a whole lot of television sets in existence - the few around were set up in "television parlors" and military hospitals - but for all intents and purposes the system worked just like network television does today. Let's take a look at Third Reich TV and see what it was all about. There is a bit of a myth that television is a purely American invention. In fact, television was the result of work by scientists around the world. Its immediate ancestor was the fax machine, first developed by Italian priest Giovanni Caselli in 1856. That got people thinking about transmitting images, and wouldn't it be great if they moved? The key advance in the early days was made by Paul Julius Gottlieb Nipkow, a Pomeranian 23-year-old university student, in 1884. He developed what he called the "electric telescope." The key part of his invention was what later came to be called the Nipkow disk, a spinning disk with a pattern of holes which each could scan a single line of an image. It had 18 lines of resolution. Nipkow quickly patented the disk, German patent No. 30105, granted on 15th January 1885, retroactive to 6th January 1884. Nipkow got involved in other things and allowed the patent to lapse, but his contribution was not forgotten and became a source of German pride. Later inventors, such as Lee de Forest, built upon Nipkow's work, which was far ahead of its time in terms of technology available to make it do anything practical. 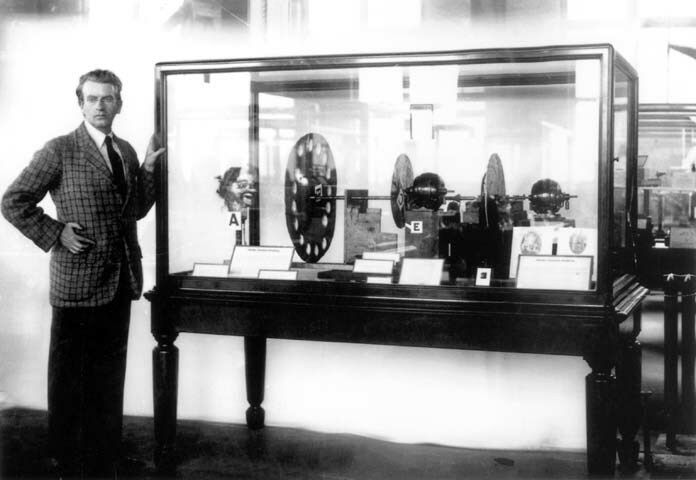 John Logie Baird with his original experimental Baird television apparatus, September 1926. The Nipkow disk can be seen clearly. Frenchmen Georges Rignoux and A. Fournier demonstrated instantaneous image transmission in 1909. It was only a 8x8 pixel resolution, but it could transmit several times a second and thus portray a moving image. Images transmitted over wires were shown by Boris Rosing in 1911. The next big advance, though, was made by Scotsman John Logie Baird on 25 March 1925, when he gave a public demonstration in London of televised silhouette images in motion. He gave a much better demonstration of a human face on 26 January 1926. Baird used the Nipkow disk and transmitted the moving image over AM radio waves. 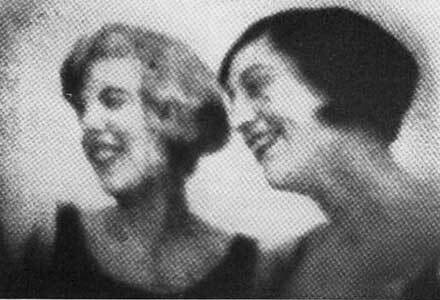 By 1928, Baird was able to broadcast one of his "moving images" across the Atlantic and from shore to ship. Others were right behind Baird, such as Charles Francis Jenkins in the United States and Herbert E. Ives and Frank Gray of Bell Telephone Laboratories in New York. The first television station, WRGB/W2XB, began operating from General Electric's plant in Schenectady, New York in 1928. That same year, Paul Nipkow himself saw television for the first time at a Berlin radio show. 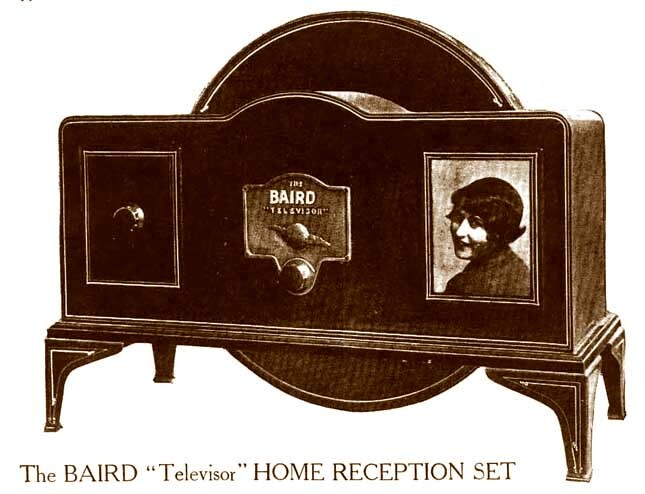 The world's first daily TV broadcasts, using Baird's 30 line low definition system, began on the BBC in 1932. The Nipkow Disk was extremely clever and got the ball rolling in terms of television development, but it was a bit impractical. It was the television equivalent of a pinhole camera - it worked, but was kind of a dead end for advanced transmission. Working in San Francisco, Philo Farnsworth, building on the work of others such as Kenjiro Takayanagi of Japan (as all scientists/engineers do), perfected an alternate transmission method. It was called "all-electronic" and had no mechanical parts. Farnsworth demonstrated it at the Franklin Institute of Philadelphia on August 25, 1934. This used a live camera and was much more practical than systems using the mechanical Nipkow disk. It was this huge advance that led to the misconception that television is an American invention, but television was developed by different men around the world. And Hitler's Germany had a use for it. Let's get the technical background out of the way first. German engineers were working hard on television in the 1920s and 1930s, just like their counterparts in other countries. The first electromechanical broadcasts there began in 1929, and they began transmitting sound as well in 1934. That's a pretty phenomenal achievement, considering that theatrical films had only begun adding sound in 1928. A television image produced by Manfred von Ardenne in December 1930. Manfred von Ardenne was a brilliant young German scientist who used an inheritance to set up his own research lab in 1928, Forschungslaboratorium für Elektronenphysik. It was just the right time to make a difference in TV. Von Ardenne was one of the most brilliant (and most undeservedly forgotten) men of his time who dabbled in a lot of different areas (including later helping to develop the atom bomb for the USSR). He demonstrated television using CRT tubes at the Berlin Radio Show in August 1931, and transmitted improved television pictures on 24 December 1933. An image from Manfred von Ardenne's "flying spot film scanner" of April 1931. It has a 60-line picture with a horizontal scan rate of 1500 Hz and a vertical scan rate of 25 Hz. Realizing the immense power of television - not everybody did, but we already said von Ardenne was a bright guy - he quickly began working on an experimental public television station. In honor of the German engineer who basically had invented television (at least in German eyes), he called it "The Paul Nipkow Television Station" (literally, Fernsehsender "Paul Nipkow" (TV Station Paul Nipkow)). Nipkow himself became honorary president of the "television council" of the Reich Broadcasting Chamber until he passed away on 24 August 1940. Paul Nipkow, standing behind the microphone on the left, appearing on German television in 1937. The first German public transmission of the new TV station was produced in the Kroll Opera House on April 18, 1934. On 22 March 1935, building on Farnsworth's work, von Ardenne started an electronically scanned television service called Deutscher Fernseh Rundfunk. The service had resolution of 180 lines and, during this transitional time, used a variety of transmission methods: Nipkow Disks, telecine film transmission, and the intermediate film system. Broadcasts were for 90 minutes, three times a week. 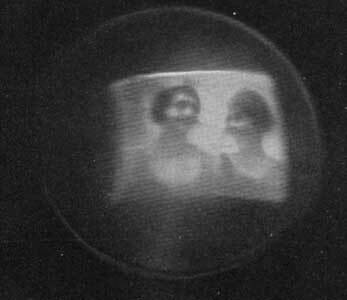 On 15 January 1936, the system began using the iconoscope system. After that, von Ardenne moved on to other things (he lived until 1997), but he had set a giant boulder rolling down the hill for others to grab onto. The E1. You can see this at Rundfunkmuseum der Stadt Fürth, Kurgartenstraße 37, 90762 Fürth. So, von Ardenne had the transmission angle figured out. The most important part of a television system, though, is the television set itself. You can have the best transmission facility in the world, but it is useless if people have nothing worthwhile to watch programs on. 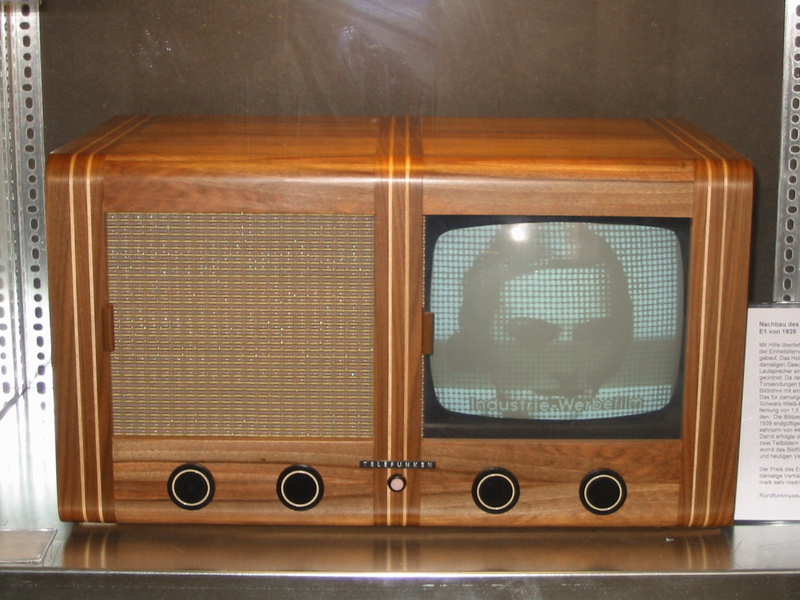 Farnsworth got bogged down in a patent dispute over a television receiver with another inventor, Vladimir Zworykin (RCA ultimately bought Farnsworth out). Two Germans, however, had filed patents in their own country two years before Farnsworth for what ultimately became the industry standard. Called the image iconoscope (Superikonoskop), it was ready just in time for the August 1936 Berlin Olympic Games. Walter Bruch at the 1936 Olympics. There were many important but largely forgotten people behind the quick rise of Third Reich TV. Let's remember at least one. 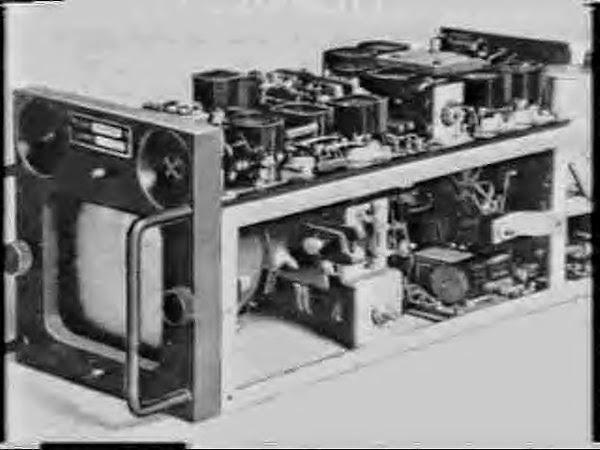 Walter Bruch presented a “people’s television receiver” in 1933 with a self-built telecine. He joined Fritz Schröter's Telefunken in 1935 as a technician in the Television and Physics research Department and worked on field tests of the first Iconoscope camera. 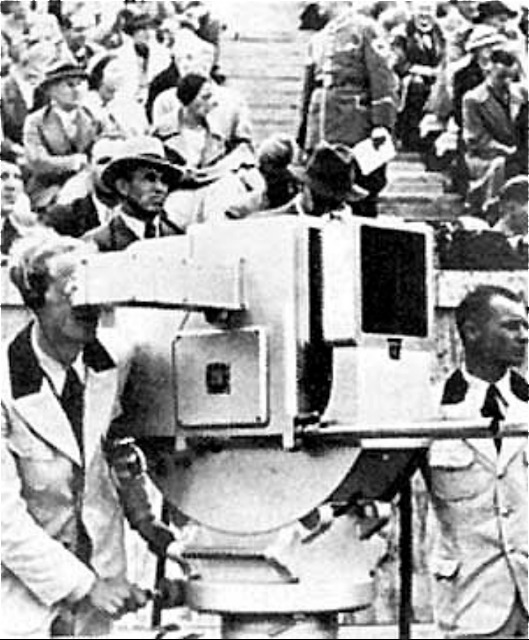 Emil Mechau of Telefunken developed a special television camera for the 1936 Summer Olympics which Bruch put to good use. In 1937, Bruch established the first all-electronic TV studio in Germany and, at the Paris International Exposition, he introduced an iconoscope television unit that he had designed. Bruch went on to become a major figure in the post-war development of television (especially color tv), and he is considered a legendary figure in German TV - which today has the most viewers of any country in Europe. 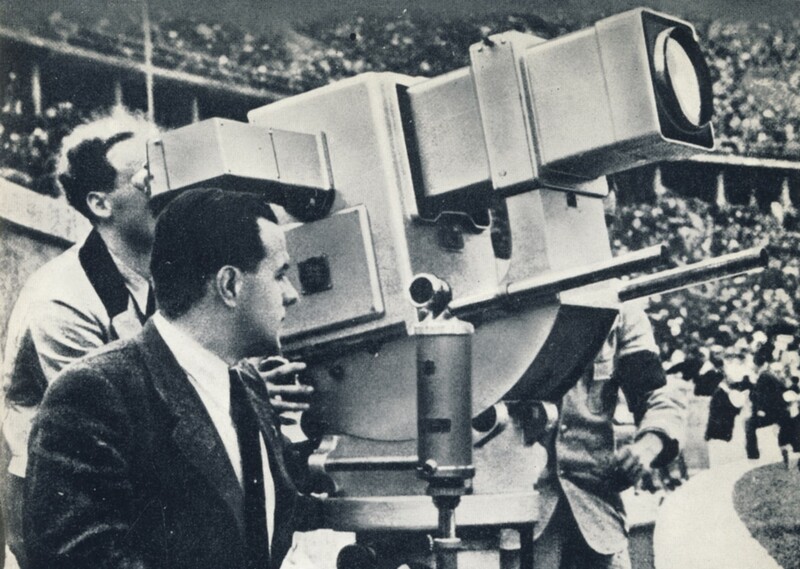 The 1936 Berlin Olympic Games put Third Reich television on the map. Two firms broadcast the Berlin Games - Telefunken and Fernseh, using RCA and Farnsworth equipment, respectively. Television cameras at the 1936 Berlin Olympics. The Berlin Olympic Games were the first sports events ever broadcast - over three years before the first broadcast football game in the United States in September 1939. The Games also, in the broader sense, constituted the first live transmission of any public event in real time. Broadcast via both all-electronic iconoscopic-based cameras and intermediate film cameras, transmissions went to "Public Television Offices" in Berlin/Potsdam and Hamburg. The Games introduced the first all-day television programming, as they were on the air for up to eight hours a day for a total 72 hours. A television viewing parlor in Berlin around the time of the Olympics. Admission was free. Since very few individuals had television sets, 25-28 public television rooms or "parlors" (Fernsehstuben) were set up. 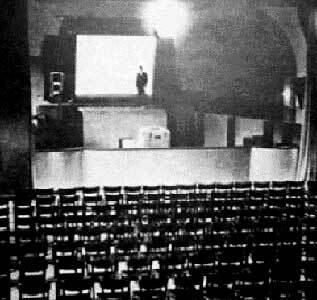 They resembled movie theaters, with images transmitted by coaxial cable to projectors which displayed the images on 8 x 10 foot film screens (thus making this the first cable tv programming). Roughly 160,000 viewers saw the Olympic games this way, a phenomenal number for the day. The Games were a huge success and burnished Hitler's image as he presided over them every day from his prominent box seat. 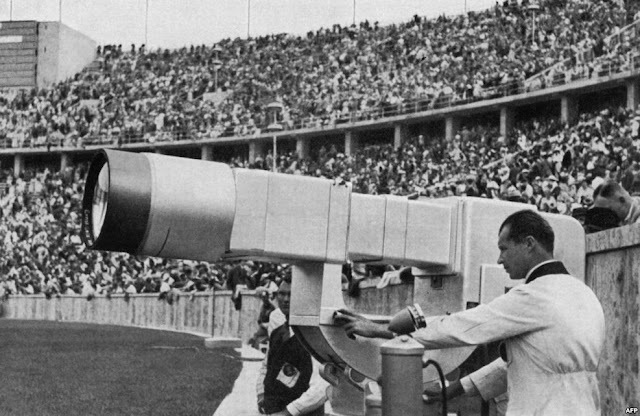 Most of the people in the stadiums had no idea what the huge telescope-like things were for. There were 21 television cameras used at the 1936 Berlin Olympics. 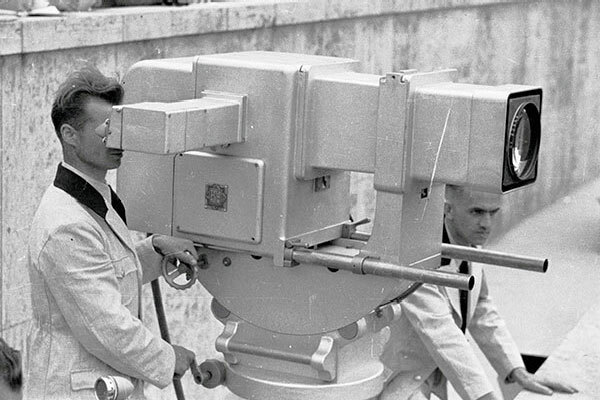 This appears to be the Fernsehkanonen (television canon), which was 6 feet long. Three of these cameras were used at the Olympics. The Germans thereafter upgraded their television technology. In February 1937, they introduced a 441-line system, which was slightly better than the British 405-line system at the time (which they had begun using in the fall of 1936). Virtually all German programming was done live, and it consisted primarily of Vaudeville-type acts and documentaries, with occasional political speeches. The project was "owned" by the Deutsche Reichspost, the Ministry of Aviation, and the Ministry of Public Enlightenment and Propaganda. In practice, the Post Office (Reichspost) was responsible for promoting the service, as they had the most daily contact with the public. The People's TV has a bright picture of deep contrast and sharpness without distortion. This results from its cutting-edge picture tube, which is rectangular with a flat fluorescent screen, preventing typical barrelling at the edges ("does not look like it was pulled over a roller").... [T]he dimensions of the screen are 19.5 cm x 22.5 cm with a diagonal of 30 cm. The sets were highly advanced for the time, at least on a par with US sets of the 1950s. The physical display size was 7.68" × 8.86," and a color television version also was shown at the exhibit simply to demonstrate the technology (but was not going to be marketed). The sets could function solely as radios, too, which remained the main means of propaganda throughout the war on both sides. Production of the E1, despite its obvious allure, was cancelled in favor of war production after war broke out on 1 September 1939. Wounded warriors watching television at the Berlin hospital. 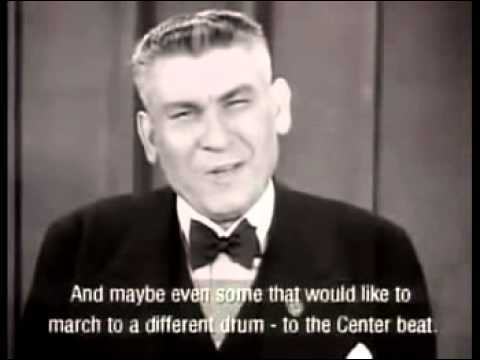 If you think that all they watched were Hitler speeches, think again: just like today, tv broadcast soccer (football) matches, variety acts and other popular things then and now. There was only one channel, so no fights over the dial! Only about 50 E1 television sets were produced, and these were placed in government buildings and military hospitals. They were used throughout the war and proved popular with the patients at the hospitals. About ten of these units still exist, several completely original and functioning. Daily programming expanded with time. The Germans had a television broadcasting antenna on the Eiffel Tower, originally put there by the fledgling French television service. 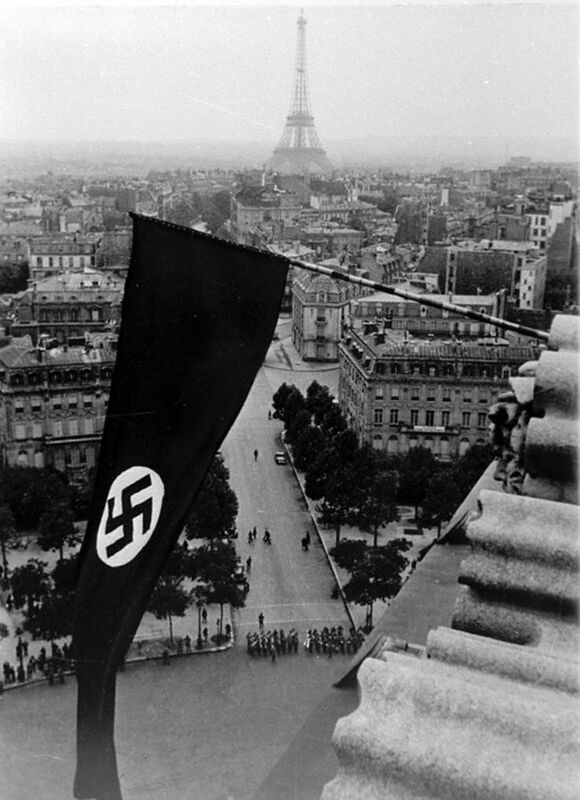 After the capture of Paris, the Germans on 3 September 1940 seized the French television service, which had installed a television antenna on the Eiffel Tower. 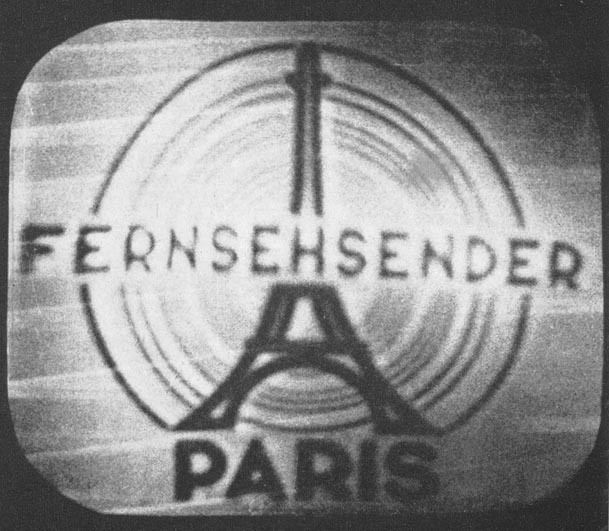 Eventually, the German Ministry of Post and Radiodiffusion Nationale resumed programming in Paris, broadcasting in both German and French (Fernsehsender Paris) from 7 May 1943. Among the more interested viewers were RAF and BBC engineers in southern England who learned what they could about the German homefront situation from the programs being broadcast. While most US programming from the 1950s and 1960s is lost forever because it was not recorded, significant portions of Third Reich TV were recorded and survived the fall of the Reich. What survives shows a mix of programming that is not that dissimilar to what you find today when you roam around the channels: variety shows, documentaries, comic acts and the like. Much of the programming in the early years was a cross between Vaudeville and nightclubs. During the war, documentaries began appearing which are a bit odd to modern eyes but would have been appreciated by the audience (primarily wounded men in hospitals). For most of the war, Propaganda Minister Joseph Goebbels left the broadcasts alone and Third Reich TV was mindless entertainment - dancing girls, xylophone players, singers and the like. After Stalingrad, though, Goebbels began to see some political uses for it, and there were more documentaries about wounded soldiers recovering from horrible wounds and so forth. These included a documentary on how amputees could contribute to society and live happy lives after losing their legs. 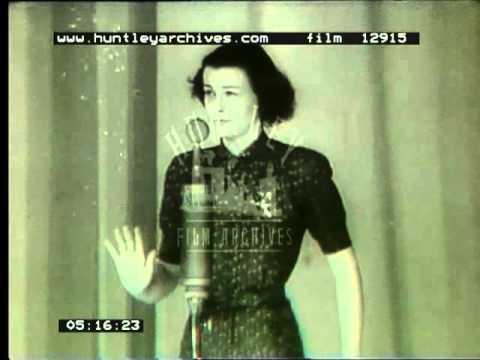 A talented singer on Third Reich TV. Some of the acts were quite good. Many top German directors of the day worked on television during the Third Reich, and some big names got their start in it. The talent included director Carl Boese, whose career transcended the Third Reich, and his protégé Frank Wysbar, contributed content. Ilse Werner became the world's first television show, hosting a variety show. A special magazine, Fernsehen und Tonfilm ("Television and Sound film") chronicled cutting-edge developments in the area, and television listings appeared in the newspapers just as they did in the post-war world. Radio shows were adapted to the new medium and became known as "teleplays," better known as "movies of the week" in the 1970s and '80s. The overall strategy became known as "maximum entertainment" and revolved primarily around high-quality- stage acts. All of this paled beside the hugely popular Olympic broadcasts in 1936, of course, but those only lasted a couple of weeks and, as any TV programmer knows, you have to put something on the air aside from special events. Hitler wanted to host the Winter Olympics again in 1940, which might have been another good TV show, but the war intervened and they were cancelled. Incidentally, let's not romanticize or sanitize what was broadcast: there was a lot of blatant anti-Semitism and propaganda. The broadcasts were a reflection of the ruling culture, just as today's broadcasts are. This fellow delivers one of the creepiest monologues in television history. The broadcasts lasted until late November 1943 in Berlin (when the antenna was destroyed in a British bombing raid). In Paris, the broadcasts lasted 5 1/4 hours per day until 16 August 1944, when the Allies were approaching Paris and the local authorities fled. 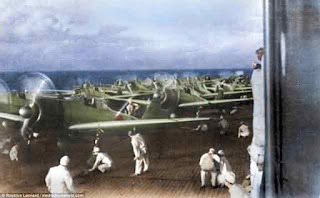 The entire project was dissolved on 18 October 1944. The Reich Radio Company produced and maintained 285 rolls of film of broadcasts (which were mostly live productions). These survived the war and passed to the East German State Film Archives, where they sat on a shelf for 50 years. They finally went to the Berlin Federal Film Archives after reunification in the early 1990s and have been digitized. These rolls of film are all that remains of Third Reich Television, and a fraction of it has been distributed on Youtube videos (see below). The videos make for interesting viewing even if you only have a passing interest in the subject. 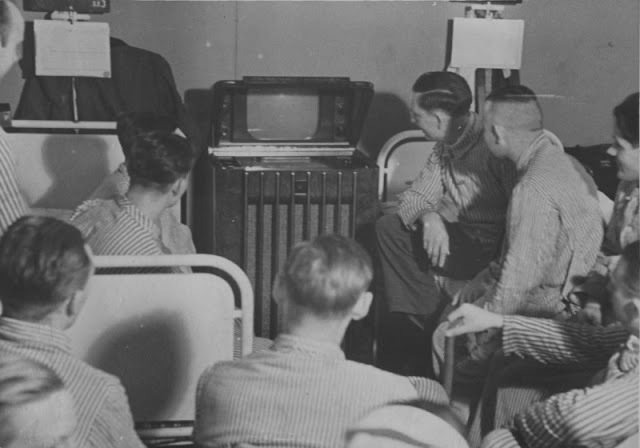 The Third Reich hierarchy might have viewed television as somewhat of a gimmick when the war began, but developments during the war made Third Reich scientists give it a second look. 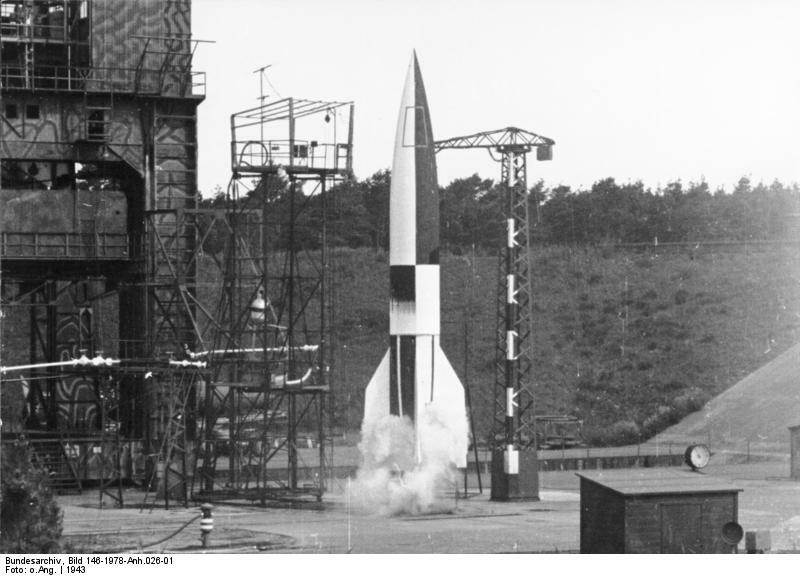 The Luftwaffe developed wire-controlled missiles which proved effective, and even radio-controlled missiles. These all required visual observation of the missile from relatively close distances. But what if you could sit in your plane above the clouds - or over the horizon - and guide the missile with radio controls while watching its flight on a television screen? That would be a lot more effective, both for the crew of the plane controlling the missile and improving the chances of the missile hitting its target at all. German World War II television remote control for missiles. It turns out that the Germans indeed were busy making a television remote control system for their Mistel Bombers when the war ended. The Mistel set-up involved a fighter attached to an obsolete bomber which was packed full of explosives. The fighter would "ride" the bomber to the target, then release it at the last minute (literally) to produce a massive explosion. The basic configuration was proven to work, but the last few seconds of flight required perfect aim or the bomber would miss the target. A television control with radio guidance, though, would solve that problem and make the Mistel a much more effective and deadly weapon. In fact, if the television controls worked properly, the fighter could release the bomber miles away from the target and not be exposed to any danger whatsoever. This project remained in development as the war ended. Another plan was to use the television guidance on the Henschel Hs 117 Schmetterling ("Butterfly") surface-to-air and air-to-air missile. In the air-to-air version, this missile would be controlled by using a joystick - just like you could use on your 1990s Microsoft pc games like Flight Simulator. The Schmetterling project was promising, and obviously the concept was completely feasible; in fact, it is used today with drones. Some say it is the future of all military planes in the 21st Century as pilots become redundant. However, neither the missile nor the guidance system was far enough along for it become operational during the war. 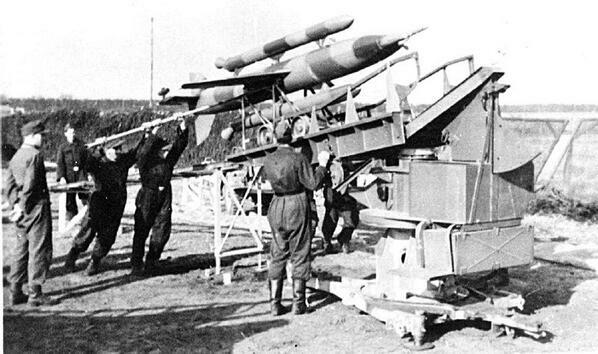 Despite poor testing results, in January 1945, production of 3,000 missiles a month was proposed. However, on 6 February 1945, SS-Obergruppenführer Hans Kammler cancelled the project in order to focus on things that were of more immediate use. Under better circumstances, the Schmetterling with its joystick control that was decades ahead of its time might have become operational in 1946 or 1947. The remote control apparatus may not have made it into guided missiles used during the war, but it did prove useful elsewhere. Walter Bruch, mentioned earlier, graduated from his work on public Third Reich TV to designing and operating a closed-circuit television system installed at the secret military rocket test site Peenemünde. Bruch used this system to control test A4 (V2) rocket launches from a safe distance within a bunker. This is considered the first CCTV system in history, built by Siemens to Bruch's specifications. Bruch also worked on TV transmission systems for planes and radar technology using the glass delay line patented by Telefunken in 1940 and used in the “Rehbock” distance control unit. Many people make up stuff about advanced Luftwaffe super-planes; but in the use of television, the Germans really were decades ahead. The Allies had nothing like any of this under development. Third Reich television lasted for about a decade. The clips that survive make for startling viewing. There are hints throughout the of the more brutal aspects of German culture, presented in a way that is eerily reminiscent of modern television programs. There is a lesson for us there. 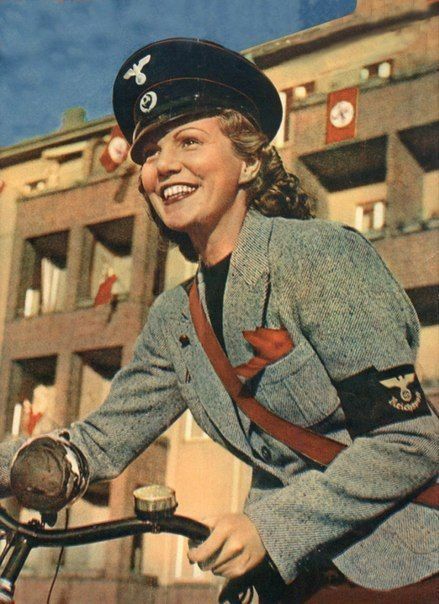 When that attractive woman sitting behind the desk in front of the camera starts talking, remember that she is advancing an agenda today just as much as the German presenters did during World War II. Learning about Third Reich television helps to hammer home the point that technology itself is morally neutral; it is the people behind the scenes who decide whether it is used for good or evil. Thank you for the identification, Ralph, I put a notation in the caption. Next time I am in Nuremberg i will make it a point to visit the museum. Vielen Dank. Other propaganda films were also broadcast occasionally to fill in the schedule when live broadcasting was not possible.